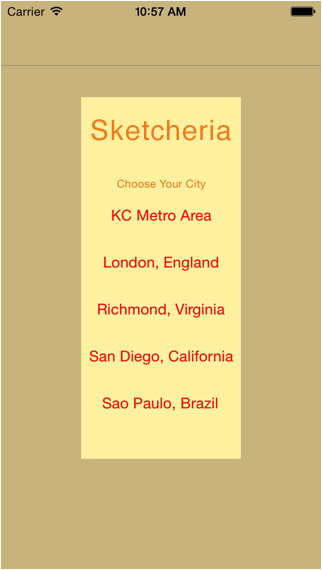 Sketcheria is an app that will unite artists from around the world into synchronized participation. Several cities worldwide will utilize individual administrators to schedule dates, times, and locations for drawing and painting activities. 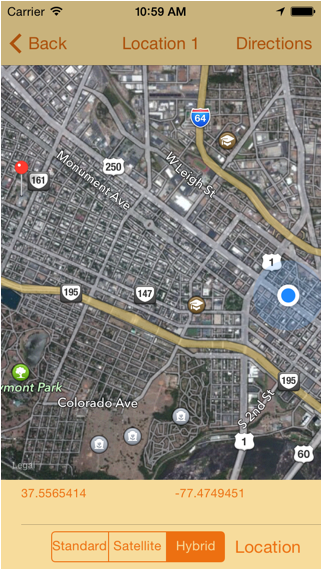 The app employs fetching information (that can be programed into a current website via a user interface), parsing the information, retrieving GPS coordinates, and showing locations on a map. This app includes an image-based database with titles, notes, and timestamps that can be edited by the users. Images can be added by accessing the Camera and/or Camera Roll. Also included is a QR Code Reader that tests for text-only code or web addresses. Admin in the participating cities can use QR codes for additional information or activities. 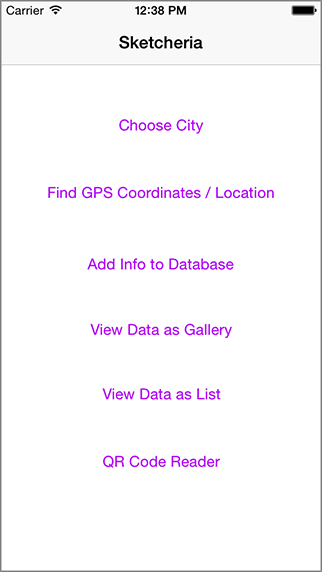 Current location and elevation is also displayed for user recording. 1. Choosing the city in which you will participate, either remotely or in person. 2. Find your own GPS coordiates and elevation. 3. Add an image to the database from your the IOS Camera, or the Camera Roll, along with a title and note. The image is then timestamped to let you know when your added the image to the database. 4. View the images and information in the database as a Gallery. 5. View the images and information in the database as a List that is editable. 6. Use the QR Code Reader to gather more information in the form of clues or additional activites left by the city administrator. Choose the city in which you live and would like to participate on the advertised date. Meet up with the others at a specified time to share the adventures of your activites, your stories, and of course, your artwork.Even if you don't live in a listed city, you can still participate by doing the acitivies listed, and post your results online later. 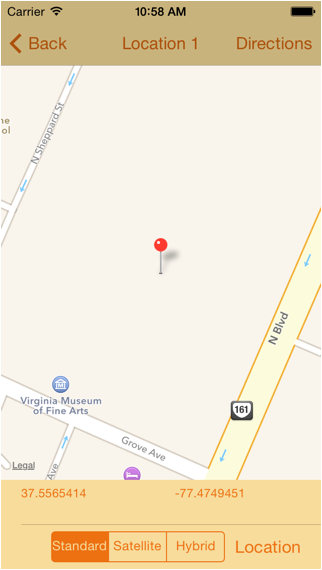 The "Received Data from Richmond Admin" text confirms the User has selected the correct location. The city selected is listed in this first line. 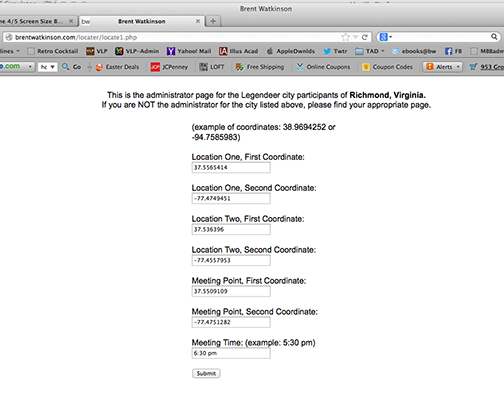 The "Meeting Time" is listed as well, and is also place near the bottom of the page. Participants will go to any or all of the locations listed to do certain activities; drawing, observation, listening, recording data, etc. A predetermined list or schedule can be upload as well. Participants can finally go to the "Meeting Location" at the listed time, to join in a group activity with other participants. 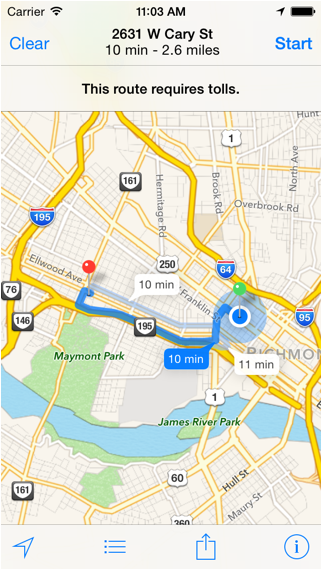 The screen above is the "Standard" map view built into the app. The red pin shows the first location, and is titled as such. 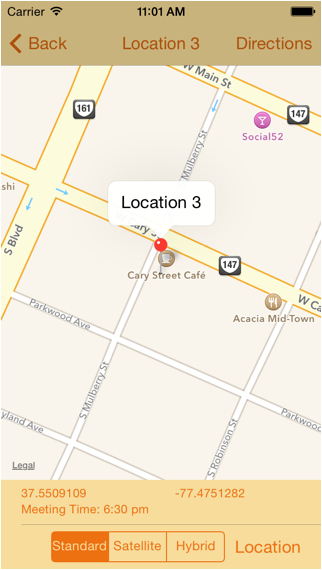 A User can find their exact location on the map by clicking the "Location" button on the bottom right. 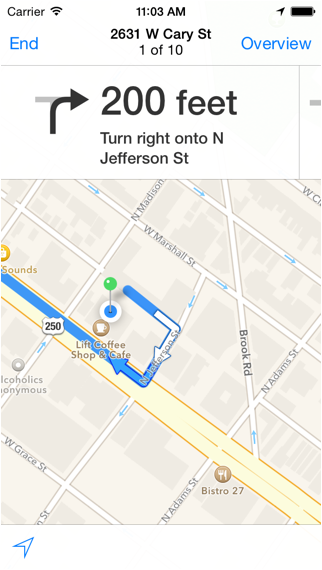 The User location is shown with a glowing, animated blue dot. Above is the "Hybrid" map view the User may select. It shows a Satellite view with an overlay of street names and places. 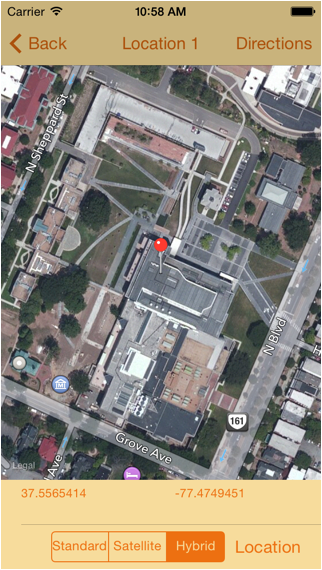 The location above, (and the image to the right), is the Art Museum in Richmond, VA.
in which to travel and perform the activities. 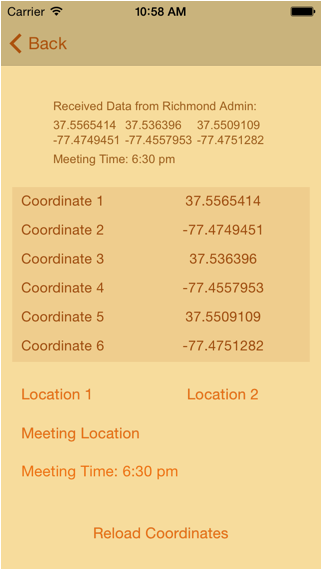 Above is the Meeting Location, with the meeting TIME displayed as well. The exact street address is shown when the User taps the red pin. The User has chosen the "Standard" view on this map. maps out a route, if necessary. Turn by turn directions are invoked, for either driving, bus or walking. Some urban areas are well suited for buses or driving, while remote locations, (such as parks or wooded areas), can use walking directions. Above is the Admin screen for Richmond, VA.